Where/when did I read this book? : I listened to this audio book in the car on my hour commute to work this past winter break. Why did I read this book? : My friend recently listened to this audio book and wanted to know my thoughts on it. + Writing style. I’m actually a bit conflicted about the writing style, but I figured I would highlight the positive aspects of it before explaining why it didn’t 100 percent work for me. 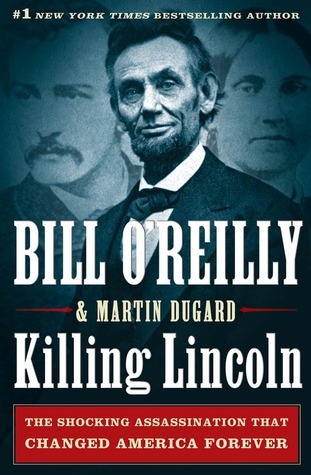 Before the actual meat of this book begins, Bill O’Reilly explains that it is written like a thriller. What does a non-fiction book written in the style of a thriller look like? Present tense. Detailed imagery. Short chapters. Intense suspense. In this way, Killing Lincoln is unlike any non-fiction history book I’ve read before. The advantage of such an interesting writing style for this blended genre is that it makes for an incredibly engaging, gripping read. This is definitely a great book to pick up if you want to get more into history or non-fiction in general. + Details. I thought I was fairly familiar with the events surrounding the assassination of Lincoln before reading this book, but afterwards I realized that I had only known the basic details of what actually happened. I really enjoyed learning about all the details leading up to the assassination as well as the chaos of the aftermath. I also appreciate the attention given to the women involved in this event (although some of the descriptions of women were slightly problematic…). It’s interesting to read about the simultaneous timelines of Lincoln, Grant, Booth, and other people involved rather than just focusing on one perspective the entire time. – Writing style. Unfortunately the writing style was a bit of a double-edged sword for me. While writing this book as if it were a novel certainly makes it more engaging and entertaining, I feel as though it also makes the information less credible. How can O’Reilly possibly know all of these tiny details about time, the weather, and people’s innermost thoughts? Reality isn’t a thriller novel, but O’Reilly certainly makes it appear otherwise. At times the sheer amount of rather irrelevant details was almost distracting. I don’t need to know that someone was “backlit by the sun” as they rode into battle–just tell me how Lincoln was assassinated! – Pacing. Another frustrating aspect of this book was its rather slow pace. While providing several different perspectives on events makes the book more suspenseful, after a while it also makes the pacing feel incredibly slow. It doesn’t help that the first hour and a half or so of this audio book was just about Civil War battles with very little mention of Lincoln. Although this is useful background information to have, it definitely could have been summarized more briefly so that the actual plot of the book–the events leading up to Lincoln’s assassination–could finally start. Killing Lincoln is certainly an interesting reading experience: I don’t think I’ve ever been so intrigued by the writing style of a nonfiction history book before. With that said, I have to say that I do prefer the more traditional ways of writing about these events. However, I would be interested in reading another of Bill O’Reilly’s books to see if this “thriller” style of writing history works better in the context of a different historical event. What are your thoughts on Killing Lincoln? Which Bill O’Reilly book would you recommend that I read next? Let me know in the comments section below!